Research supports the view that all children with Down syndrome will benefit from being read to and from being in reading instruction from an early age as these activities will improve their spoken language and memory skills. Children with Down syndrome learn to read in the same way as typically developing children. They build on their good visual memory skills but find it more difficult to use phonics. In other words, they benefit from learning to read through a 'whole-word' learning strategy initially, bringing in phonics knowledge at a later date. While children who are introduced to reading in their preschool years show the highest levels of achievement, studies indicate that teenagers and young adults can continue to develop their reading abilities if given appropriate instruction. Reading is a fundamental life skill. Print is all around us in our daily lives and we acquire reading and writing skills for practical use (street names, sign posts, adverts, instructions) and for pleasure (writing a card, making a shopping list, looking up a television programme). 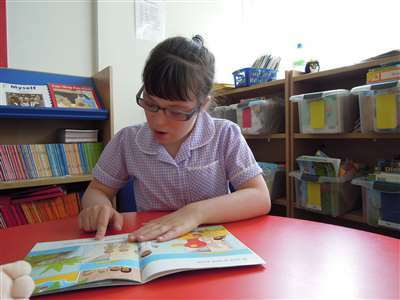 Reading will help children with Down syndrome to develop vocabulary and grammar knowledge and will give added practice, and therefore improve spoken language skills. Reading practice will also help to develop working memory skills. The ability to read and write facilitates easier access to general knowledge and the school curriculum and it supports the skills necessary for problem solving and thinking strategies. There is also evidence for the beneficial effect of reading on speech and language skills. Case study records suggest that early reading activities encourage progress to longer utterances and improved grammar in speech. They also suggest that reading improves articulation and speech intelligibility (the ability to be understood by the listener). For most children with Down syndrome, language comprehension (understanding) is better than language production (talking/signing). This means that children with Down syndrome understand more than they can say, probably due to a variety of issues, which may include problems with word retrieval, sentence structuring and speech-motor control. Working memory difficulties may also contribute to the speech and language delays that children with Down syndrome often face, limiting the amount that a child can organise and say clearly in a sentence. Reading provides opportunities to practise saying sentences that a child is unable to generate spontaneously even through he or she understands them. When children are reading aloud, the sentence is organised for them and the print is available without having to remember it, so the demands on the working memory system are reduced and its capacity can be used to plan and articulate each word more clearly. Reading stories daily to children from infancy right through childhood will help them to learn to read. Children who are read to know that books are fun and provide entertainment. Children who are read to often have larger vocabularies and they will know that the words on the page have meaning and tell the story. One of the most important ways in which parents of children and teenagers with Down syndrome can help them to be ready to read and be interested in books, is to read to them and talk to them about the stories they have read. It is important to teach whole words and to develop reading for meaning as the first step - learning letter sounds will come later. All children learn a visual 'sight' vocabulary of words, remembered and recognised as whole words. As they start to read, they slowly develop the phonic skills (letter sounds that make up words), which will lead to them being able to sound out unfamiliar words and spell. A child should have a sight vocabulary of at least 50 words, which can be read and understood with confidence in simple sentences, before teaching any phonics. The incidence of mild to moderate hearing loss in children with Down syndrome is high and remembering some simple guidelines can help to compensate for their difficulties. Many children may only have a small amount of hearing loss, although hearing levels can fluctuate, but even a small amount of hearing loss affects listening and can affect behaviour, performance and language learning. Therefore, it is advisable to take account of possible hearing difficulties at all times by gaining your child's full attention before starting and working in environments that do not have competing background noise. Children can only read with understanding if they already know and understand the words, the grammar and the sentence structures used in the text. Therefore, it is important to introduce reading activities at each child's comprehension level. Children with Down syndrome will usually be delayed in language comprehension compared with other children of the same age and it is important to begin with vocabulary that they understand and with short simple sentence structures. As children with Down syndrome progress and begin to read simple text with confidence, using language that they already know, reading then becomes a powerful tool to use to teach new vocabulary and grammar. Reading activities can begin when a child understands 50-100 words and can match and select pictures (e.g. picture lotto games). The same method used in these types of activities will be used to teach sight words. Reading activities can start by using pictures to match on a 2 or 4-picture lotto board. Choose a picture and say "This is a …. (cup) - which one is the same?" Guide your child's hand to complete the task successfully, even if that means physically moving his/her hand to guide the picture to the correct match. Provide as much support as your child needs to be successful and take away support as your child becomes familiar with the activity. This is called 'errorless learning'. It is important to remember that this is not a test and your child is meant to succeed each time. Practise this game until your child can successfully match all the pictures on the board with minimal, if any, support. Using the pictures that your child has just matched with minimal support, ask him/her to 'give me (or show me) the …..(cup)'. Guide your child through the correct response; continue to practise with these words until your child can select each picture when it is named. Children may name words using signs or spoken words. Articulation problems may mean that spoken words are not clear. Praise and encourage approximations to word-reading, as practice helps children to make their speech clearer. Encourage your child to imitate the word. Repeat words after they have been said or signed, providing a model for correct pronunciation. Use 'errorless learning' and prompt children with the correct answer, until they can say the word without hesitation. Once your child can match and select pictures confidently in this way, written words can be introduced. Words for reading can be chosen from your child's own vocabulary (the pictures they are matching and selecting correctly each time). Once your child can match pictures, it is important to go back to the beginning and teach the same words, but in the written form (with no picture), playing the same matching, selecting and naming activities with the words. All children are likely to begin to learn to read with some of the words that are very familiar to them and are heard and used throughout daily routines, such as 'Mummy', 'Daddy', child's name, brother's and sister's names, important people or pets. They are then more likely to be interested in reading games about words for their favourite animals, favourite food and drink, favourite toys and play activities, social words, and favourite places. Colour words and 'big' and 'little' can also be taught, as these can also be used to teach children to join words together in speech and sign. Reading colour, shape and size words often seems to help children to understand them. It is important to begin reading with words that are nouns, verbs, and adjectives so that you can move from single words to word combinations quite quickly. Children need only learn a small sight vocabulary to begin to join words together meaningfully and usefully. Choose a few nouns, a few adjectives and a few verbs to make up their first 8-10 words, so that you can build short phrases and sentences and make individual books right away. One example of a word lotto board could be 'Mummy', 'Daddy', child's name, and sleeping. Once your child can match and select these written words, you could then make a little book with the simple sentences 'Mummy is sleeping', 'Daddy is sleeping', 'child's name… is sleeping', with corresponding pictures of each person sleeping. You could then move on to eating, jumping, drinking, etc. Most children love looking at photos of familiar people, so this activity is an ideal way to maintain your child's focus and attention while learning to read. Word to word (matching, selecting and naming) - no pictures. Word to picture (this can be used to make sure your child understands what he/she is reading). Once your child is able to communicate expressively, take what he/she says and make the shortest correct sentence out of it. For example, if your child says "sand" or "play sand" when asked "What did you do today?" then write "I played in the sand" in a little book and draw a simple picture of your child playing in the sand (simple stick-figure drawings are fine for this). This is an example of expansion - the term used when we speak to young children and expand their one and two word utterances. In this way, we are modelling simple, grammatically correct sentence use and your child is practising speaking in simple grammatically correct sentences when reading the sentence aloud. Make the above activity more formal by using it as a link between school and home - a conversation diary. At the end of each nursery/school day, an adult asks the child "What would you like to tell Mummy and Daddy about school today?" Take whatever the child says and make it into a simple, grammatically correct sentence, with a picture added for meaning. When the child gets home, he/she shares the diary with mum and/or dad, either by reading it or participating in supported reading (imitating word by word, or pointing to the words as they are read by an adult). Then parents make entries at home for the child to take to school, to be read with an adult at school. Make personal books with photographs or pictures that are tailored to your child's particular interests - using words and simple sentences to label each picture. Make personal books about your child's daily life - 'My favourite animals', 'My day at the zoo', 'I can…', 'I like…', etc. Action games where the word (verb) or sentence with a verb in it is read, and then the action is undertaken. Young children with Down syndrome learn to read by remembering whole words and their meanings before they are able to separate out the sounds in words and apply their letter sound knowledge to the task of reading. They are, however, able to learn about letters, the sounds associated with the letters and their names. Therefore, young children with Down syndrome should have access to and enjoy typical pre-school (and school age) learning games about the letters and sounds of their language, participating in phonics teaching activities with their peers. The value of teaching reading and using reading activities to develop the spoken language skills for children with Down syndrome can not be underestimated. Children should be introduced to reading in a fun way, first learning to read whole words by playing matching, selecting and naming games and then moving on to reading short sentences and longer sentences in topic books. All the activities and reading should be based on your child's interests and experiences, and needs to be linked to your child's language comprehension levels (understanding) and language learning needs. Children who have not made rapid progress with reading will still have benefited from these reading games and activities, as they are powerful and enjoyable ways of improving their understanding and use of spoken language. Reading and writing for individuals with Down syndrome - An overview (2001). Sue Buckley. Down Syndrome Issues and Information, The Down Syndrome Educational Trust. Reading and writing for infants with Down syndrome (0-5 years) (2001). Gillian Bird and Sue Buckley. Down Syndrome Issues and Information, The Down Syndrome Educational Trust. Reading and writing for children with Down syndrome (5-11 years) (2001). Gillian Bird, Jane Beadman and Sue Buckley. Down Syndrome Issues and Information, The Down Syndrome Educational Trust. Reading and writing for teenagers with Down syndrome (11-16 years) (2002). Gillian Bird and Sue Buckley. Down Syndrome Issues and Information, The Down Syndrome Educational Trust. Memory development for individuals with Down syndrome (2001). Sue Buckley and Gillian Bird. Down Syndrome Issues and Information, The Down Syndrome Educational Trust. Interactive reading books. Greenhouse publications. Teaching Reading to Children with Down Syndrome - A Guide for Parents and Teachers. Patricia Logan Oelwein (1995). Woodbine House. Classroom Language Skills for Children with Down Syndrome - A Guide for Parents and Teachers. Libby Kumin (2001). Woodbine House. First Keys 2. Early Literacy skills. Widgit Software Limited. On the Farm. Early literacy skills. Inclusive Technology. abc-CD. Talking animated alphabet. Sherston Software Ltd.
Oxford Reading Tree, Stage2 and 3. Word, sentence and text-level activities. Oxford University Press. Speaking for Myself. Early language development in education. Topologika Software Limited. Making Tracks to Literacy. Early literacy and pre-reading activities. Widgit Software Limited. WordShark 2. Reading and spelling games. White Space Limited. Wellington Square. Reading skills for school-age children. Semerc/Granada Learning. Clicker. Talking word processor with 'on-screen keyboard'. Inclusive Technology Limited. Pops books. Published by Daneth Limited.